The British school’s mission is, in accordance with the Anglican Church framework, to educate people, helping them in their cognitive and values development under a responsible liberty concept, forming active citizens: people who generate changes. The British School aims to fulfill its philosophical ideals through a specific mission: to form creative people, focused on the development of the Magellan Community, and aware of their involvement worldwide, based on the Christian faith, quality education and bilingualism. Creators and Innovators in our daily tasks. 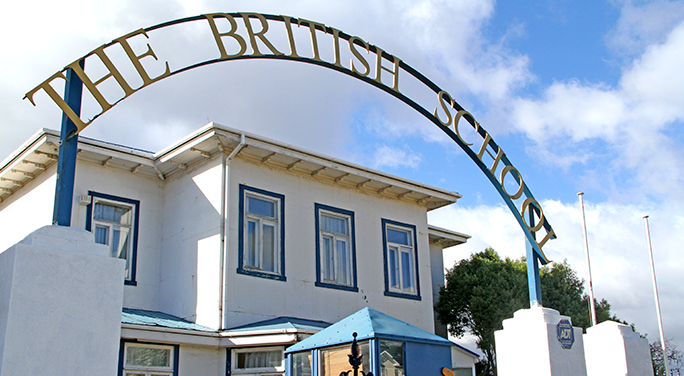 The Corporación Británica of Punta Arenas is a NON-PROFIT organization which objective is to manage The British School. The Corporación Británica was stablished by the authorization of the Ministry of Justice through the decree Nº 1023 of august 8th 1990, published in the Diario Oficial of August 3rd of the same year. The Corporación Británica of Punta Arenas is directed by a board whose members are elected by the Assembly, for a period of 3 years. One of them is elected by the Corporación Anglicana of Chile as a direct representative of the Diocesan Bishop. The current president of the Corporación Británica of Punta Arenas is Mr. Jaime Araneda González. –	To maintain links with the Anglican community, through the Anglican Society of Punta Arenas and the CorporaciónAnglicana of Chile, in order to teach the Christina principles. –	To emphasize not only a high level of intellectual development, but to promote the religious, moral, physical, social and cultural development, which will be shown in the character, honesty, integrity, etc. Our establishment is organized under the management of a Principal, assisted by the Senior Management Team, teachers and an administrative team. The educational establishment follows the Planes y Programas de Estudio (decree 129/1946) that are available to parents and can be found with the secretaries in any of our buildings, Junior and Senior. The British School is an institution certified as a “Colegio de Especial Singularidad” under ministerial resolution DS 543 of October 15th 1998. This certification allows us to include our own curriculum, which enables us to improve it constantly. The school is organized in two section: Junior School, for pre and middle school and the Senior school, for the last year of middle school and high school. The staff work in teams according to the need of our educational project. Continually the work of the teacher is being assessed. This evaluation varies: self-evaluations, peer-evaluation and an evaluation by the institution. The head teacher and Program Coordinators are assessed in their specific work. Each year, the entire community goes through a process of improvement.